For quick cooling, turn the temperature control dial to the MAX A/C position. 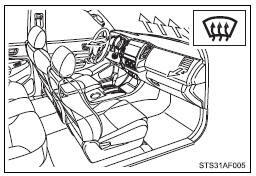 The air conditioning will automatically turn on and the air intake selector will be set to recirculated air mode. Turn the fan speed control dial clockwise (increase) or counterclockwise (decrease). Set the dial to OFF to turn the fan off. 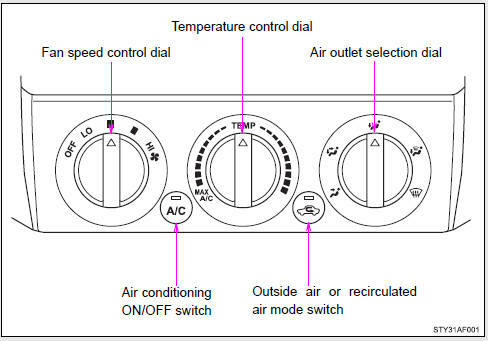 Set the air outlet selection dial to an appropriate position. The positions between the air outlet selections shown below can also be selected for more detailed adjustment. When the dial is set to , air flows to the upper body. When the dial is set to , air flows to the upper body and feet. When the dial is set to , air flows to the feet. 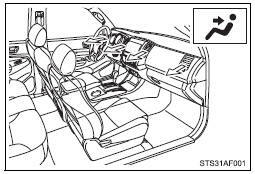 When the dial is set to , air flows to the feet and the windshield defogger operates. The air intake selector is automatically set to outside air mode. 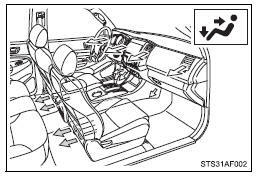 In this position, the air intake selector cannot be changed to the recirculated air mode. 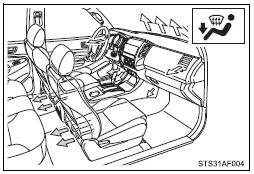 When the dial is set to , air flows to the windshield and side windows. The mode switches between (outside air mode) and (recirculated air mode) each time the switch is pressed.